In this refreshing new volume, strategic planning of budget management is looked at with a broad, positive perspective. Whether because of cuts in funding, enrollment decline, or academic cutbacks, the necessity for strategic planning in a university comes out of unfavorable circumstances. The chapters cover the planning process from start to finish, with an emphasis on a final goal of bringing the library’s status from one of an economic competitor to a deserving equal in the eyes of the academic community. The development of programs and long--term goals for various programs with realistic results in mind are stressed in this timely book. Strategic planning can be an effective managing tool in the midst of uncertainty and constant change. Cooperation, collaboration, and communication are all essentials for reaching this goal, and the authors of the 13 chapters describe in detail past instances in which these were successful. 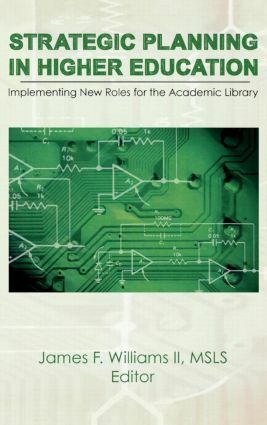 Readers will find that several major themes tie the diverse chapters of this book together, such as becoming successful in applying for limited institutional resources; giving the library’s goals a more prominent position among the members of the campus administration; and using the planning exercise to help the members of the academic community better understand the administrative decision-making process. Written by college and university presidents, campus planners, and librarians, this book clearly outlines the methods and benefits of strategic planning and provides an encouraging picture of what can be achieved when the process is used.